Are you looking for new ways to improve engagement with your audience? 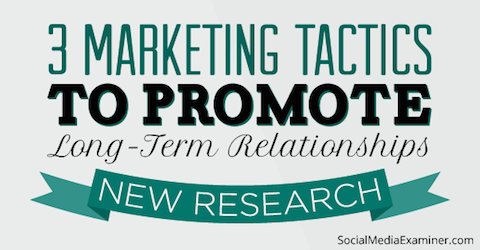 Do you want to know the most effective, yet rarely used social tactics? In this article I’ll share research findings that reveal three widely underused tactics you can use to build a long-term interested audience. A lot of brands default to Twitter for social customer care. While there’s nothing wrong with that, it’s important to remember that Facebook offers plenty of customer service options you can leverage as well. Use these under-used marketing tactics to build relationships for your business. 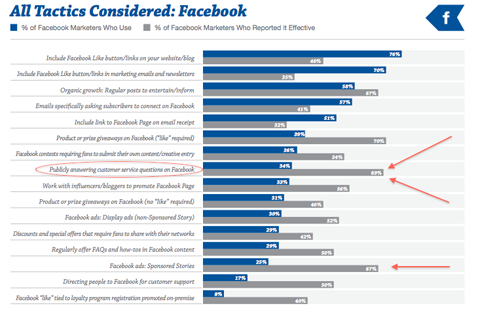 According to Exact Target’s Audience Growth Survey Report, only 34% of marketers use Facebook to publicly answer customer service questions. However, 69% of those who publicly answer questions say it’s effective. Think beyond Twitter and consider using Facebook as a customer service tool. Many top brands such as KLM, T-Mobile and Straight Talk use Facebook to respond to and resolve customers’ questions and problems. KLM, for example, offers customer service on their Facebook page 24 hours a day, seven days a week, in 10 languages. They even have a live Response Time app that tells people how long they can expect to wait for a reply after they’ve asked a question or made a request. If you’re ready to start using Facebook for customer service, I suggest checking out Socialbakers’ customer service meter called Socially Devoted. The meter measures how your brand currently communicates and responds to customers via Facebook or Twitter. Measure your brand’s social customer service rating with Socialbakers’ Socially Devoted tool. 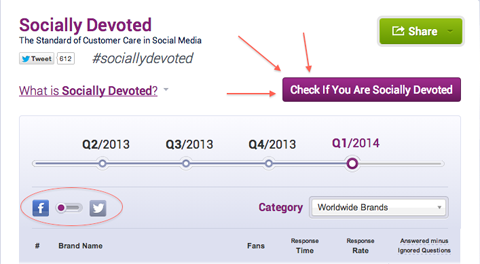 To see how socially devoted your brand is, move the slider (circled in the image above) to Facebook and click on the purple box to enter your social credentials. Use the results to guide your new commitment to Facebook customer service. In addition to Twitter (not instead of), use Facebook as a customer service support tool. Even if your organization can’t match KLM, you can still provide your customers with up-to-date information on your Facebook page. Only 22% of marketers surveyed regularly offer FAQs and how-to content via their tweets. However, 59% of those who share offer FAQs and how-to content find it’s a good way to build long-term audience engagement. FAQs and how-to tweets are highly effective for keeping Twitter audiences engaged. FAQs or how-to articles are popular because they add value without appearing to have an agenda—they aren’t a hard sell. As a result, your followers feel naturally compelled to click on your links and retweet them to their friends and peers. 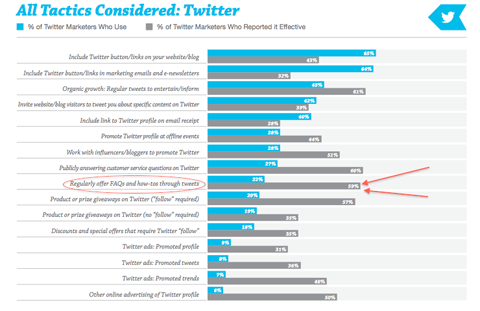 As you can see in the chart above, common tactics like adding a Twitter button on your website, blog or email newsletter weren’t deemed as effective as less-popular tactics like serving up a regular dose of how-to tweets, working with influencers and bloggers on Twitter and promoting product giveaways that require a Twitter follow. On Twitter, experimentation is key. Think about the FAQs and how-to articles you typically post on your website or blog. Why not turn those into a series of tweets and offer them to your Twitter followers on a regular basis. Of course, you don’t always need to write a blog post to provide value to your audience. Value is value, even when it’s composed in 140 characters. Email is the primary tactic for driving sales, so it’s important to build your list every chance you get. Surprisingly, most marketers aren’t taking advantage of social media to do that. Convert social media audiences into hard leads by offering content that requires email registration. 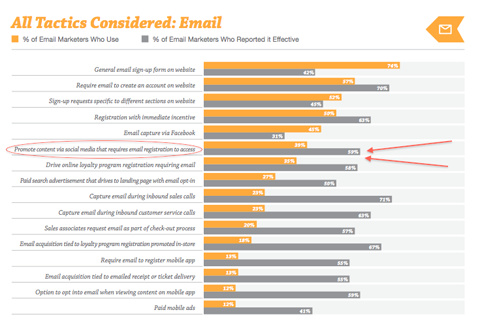 Only 39% of marketers promote content on social media that requires email registration. On the other hand, the 59% of marketers promoting email-accessible content say it’s proven to be an important component of building their lists. Amy Porterfield uses this approach by identifying and using at least three Facebook lead-generating opportunities for collecting email subscribers. You can do the same by implementing specific Facebook content that attracts your fans’ attention (you already know their interests, so this should be easy). You couldoffer access to webinars, ebooks, free reports and checklists in exchange for an email address. Once you’ve decided which lead-generating opportunity you’ll use, go a step furtherand promote it to get wider reach. 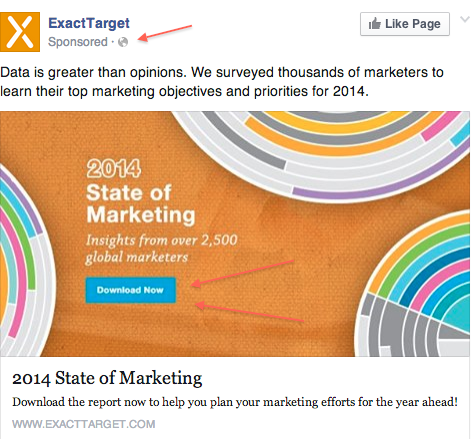 ExactTarget keeps Facebook fans engaged with free reports in exchange for email addresses. In the example above, ExactTarget offered a free marketing report in exchange for email subscriptions, and then promoted the post as a Facebook sponsored story to extend their reach and get additional email subscribers who otherwise wouldn’t have seen their post. As you consider various tactics to grow your list, focus on how you can turn your social media followers (especially those on Facebook) into hard leads (email subscribers). Remember, most of your fans are willing to provide an email address in exchange for something that’s valuable to them. Everywhere you look, you see advice on which tactics to use to grow the size of your audience (and it’s almost always the same advice). The problem is, the most commonly used social marketing tactics don’t always perform very well in the long run. 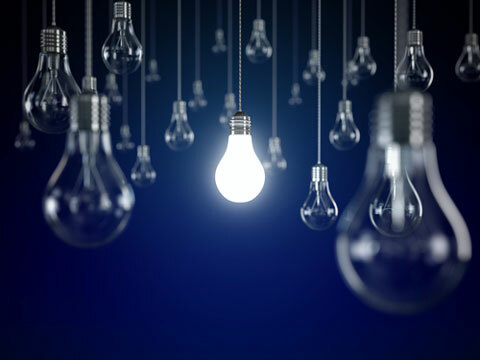 Consider using less-widespread social tactics that might inspire your audience. Image: Shutterstock. The simple truth is that numbers aren’t enough. You need a responsive audience if you want your brand to thrive. A small number of marketers are discovering that less-popular tactics may hold more promise for developing long-term customer relationships and engagement. To develop a high-quality audience, try the tactics in this article, track the responses and let the data guide you. Continue to listen and learn more about what clicks with your audience.